The lead engine is a GP40. The roof boxes are winter hatches for redirecting hot air back into the car body for cold weather operation. Notice the trucks on the GP9's, they are from Alco. Cool movie! 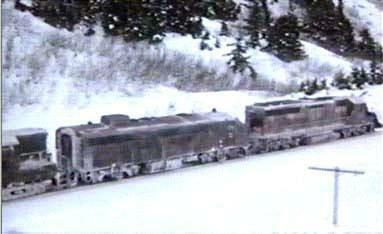 That film was made almost entirely on the Alaska Railroad. The lead unit is a GP49. 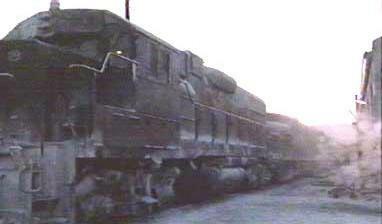 Then came an FP7, and then a pair of GP9's. 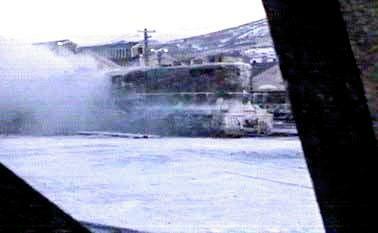 The boxes on the roof are known as "winterization hatches". They keep snow from getting into the radiators among other things. The Alco trucks on the trailing Geeps were just that way on the ARR....they specificed the units be built with trade-in trucks from old MRS-1's!! As I understand it the GP9's are chop noses, the film folk thought they'd look better in their as built condition so they built the noses back up. 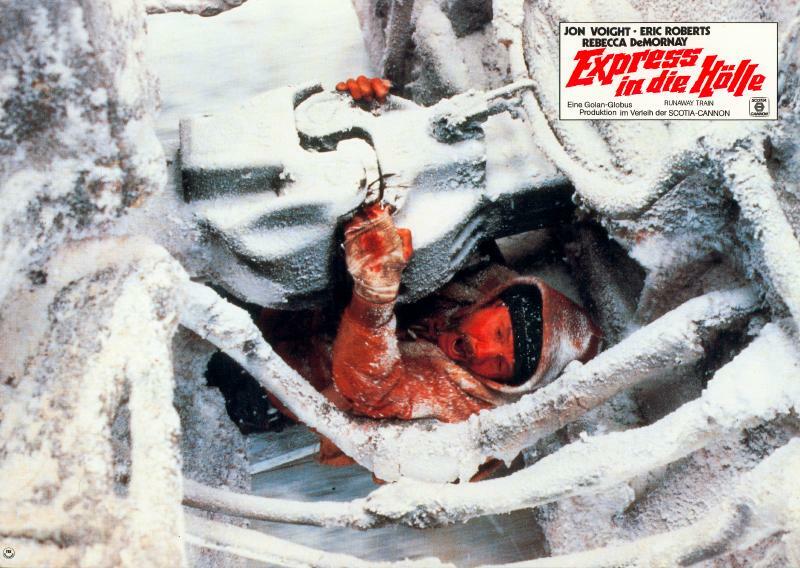 There's a web site dedicated to the train where one of the ARR guys talks about walking around the corner of a building in the yard and coming to a dead stop wondering where the "old diesels" came from before he realized they'd been worked on by the film crew. From what I recall part of the deal was no easily identifiable markings to tie ARR to the concept of a runaway train( though we train buffs were able to pretty much nail it down through the other trains in the flick)so hence the grimy non descript livery but they were honest to gosh ARR locos. The old ARR scheme wasn't as colorful as it is now. 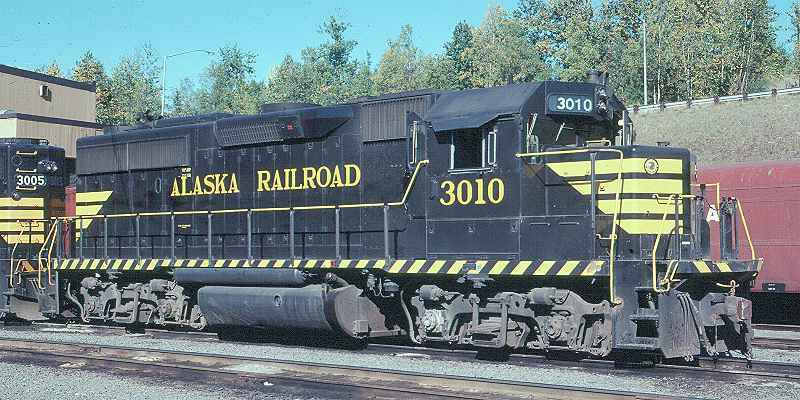 This is the lead unit I believe, and it is a GP40-2 because of the window to the left of the first A in Alaska. It's a window that allows them to see the water level sight glass, a characteristic of EMD Dash 2 models. And can you say "Lose your fingers" ?! Interesting. I've never noticed that.